Copyright 2011 Elsevier B.V. This article is provided by the author for the reader's personal use only. Any other use requires prior permission of the author and Elsevier B.V. NOTICE: This is the author's version of a work accepted for publication by Elsevier. Changes resulting from the publishing process, including peer review, editing, corrections, structural formatting and other quality control mechanisms, may not be reflected in this document. Changes may have been made to this work since it was submitted for publication. A definitive version is subsequently published in Computer Physics Communications 182, 1245-1252 (2011), DOI:10.1016/j.cpc.2011.02.010 and may be found at here. An accurate finite element method is developed for atomic calculations based on density functional theory (DFT) within local density approximation (LDA) and Hartree-Fock (HF) method. The radial wave functions are expanded by cubic Hermite spline functions on a uniform mesh for , and all the associated integrals are analytically evaluated in conjunction with fitting procedures of the hartree and the exchange-correlation potentials to the same cubic Hermite spline functions using a set of recurrence formulas. The total energy of atoms systematically converges from above, and the error algebraically decays as the mesh spacing decreases. When the mesh spacing is taken to be bohr , the total energy for an atom of atomic number can be calculated within error of hartree for both the LDA and HF methods. The equal applicability of the method to DFT and the HF method with a similar degree of high accuracy enables the method to be a reliable platform for development of new functionals in DFT such as hybrid functionals. The electronic structure calculation of atoms[1,2] is one of most fundamental bases in not only understanding electronic structures of molecules and solids, but also developing efficient and accurate electronic structure methods. For the latter case, it is indispensable to distinguish the intrinsic error produced by the theoretical framework itself from that caused by the other numerical problems such as incompleteness of basis set and inaccurate numerical integration, which will be referred to as non-intrinsic error hereafter. If the non-intrinsic error is extremely small, the validation of electronic structure methods can be very precisely performed, which may highlight strength and weakness of each method without suffering from any appreciable numerical error. By the recent advance of the electronic structure methods, requirement for the intrinsic error has been approaching chemical accuracy (1mHartree). [4,5,6] One can imagine that the requirement for the intrinsic error should be smaller than the chemical accuracy for further development of accurate electronic structure methods. A potential approach which can minimize the non-intrinsic error is a finite element (FE) method in which wave functions are expressed by a linear combination of piecewise polynomial functions. [7,8,10,9,11,12,13,14,15,16] Since the approach based on the FE method can be regarded as a traditional basis set method, once a highly accurate FE method is established, it is apparent for the FE method to be widely used as a platform for development of new functionals in density functional theory (DFT)[17,18] and post Hartre-Fock (HF) methods. The equal applicability of the method to DFT and the HF method with a similar degree of high accuracy is also highly important because hybrid methods, in which DFT and wave function theories such as the HF method are unified in a single framework, have recently attracted much attention. [6,19,20,21,22,23] Although a wide variety of FE methods have been already developed for atomic calculations so far,[7,8,10,9,11,12] the equal applicability of the method to DFs and wave function theories has not been clearly established. In DFT calculations numerical integrations have to be essentially employed due to non-analytic nature of exchange-correlation functionals, while two electron repulsion integrals can be calculated analytically in wave function theories such as the HF method. The difference in evaluating matrix elements for exchange-correlation potentials limits the equal applicability of each method to DFs and wave function theories with a similar degree of high accuracy. In this paper, in order to establish a basis for development of electronic structure methods which may consist of a DF and a wave function theory, we present an accurate finite element method for atomic calculations based on not only DFT, but also the HF method. To address the equal applicability of the method to DFs and wave function theories, we use one of the simplest piecewise polynomial functions, i.e., cubic Hermite spline functions, as basis functions, and show that the use of the cubic Hermite spline functions allows one to analytically evaluate all of integrals involved in conjunction with fitting procedures of the hartree and the exchange-correlation potentials to the same cubic Hermite spline functions. As a result of the analytic evaluation of matrix elements, it is found that the non-intrinsic error in the DFT and HF calculations can be systematically reduced by only decreasing the mesh spacing, and that eventually the FE method can provide numerically exact solutions within machine precision for all the atoms (Z=1-103) in the periodic table. This paper is organized as follows: In Sec. II the theoretical framework of the FE method using the cubic Hermite spline functions is presented for DFT within local density approximation (LDA) and the HF method. In Sec. III numerical accuracy of the FE method is demonstrated by the total energy energy calculations of all the atoms (Z=1-103) in the periodic table. In Sec. IV we summarize the FE method, and discuss a future possible application of the method in development of a new functional in DFT. Throughout the paper, we use atomic units, where . The spline function satisfies a set of conditions that , , and , while satisfies , , and . The superscript for in Eq. (7) means that the origin of is shifted to , where is given by . Figure 1: (Color online) (a) Cubic Hermite spline functions and defined by Eqs. (8) and (9). (b) Two sorts of regular meshes and in -coordinate, which are used for fitting of the hartree and exchange-correlation potentials. It turns out that the matrix elements depend on the site as a result that the extent of region spanned by the basis function in -coordinate varies depending on the site . Also it is noted that four on-site matrix elements at have to be calculated by taking account of a fact that the basis functions span only the region ranging from to in -coordinate, resulting in Eqs. (18)-(20). As well as , the matrix elements for , , and and the overlap matrix elements can be analytically evaluated, and all the analytic formulas and MATHEMATICA codes for generating them are provided in Secs. S-1-12 of the supplemental material. Although the matrix elements for can be analytically evaluated as shown in the section of HF method, for the LDA calculation we present an alternative numerical method which is much faster than the analytic counterpart, while keeping numerical accuracy. Thus, one may see that in LDA the remaining matrix elements which are numerically evaluated are only those for the hartree and exchange-correlation potentials in the FE method. The integrals involved survive only if , or for , and or for , and there are 24 and 16 non-zero elements for the former and the latter, respectively, which can be easily evaluated in analytic formulas. The other combinations give always zero elements due to the strictly localized spline functions. All the analytic formulas and MATHEMATICA codes for generating them are provided in Secs. S-15-21 of the supplemental material. The matrix elements for the exchange-correlation potential can be calculated by just replacing with in Eqs. (25) and (26) after and are calculated by LDA. Thus, from the above derivation we see that all the matrix elements required in the FE method within LDA are evaluated without introducing numerical integration which can be a serious source of numerical error. It is also pointed out that the extension of the method to generalized gradient approximation (GGA) has no difficulty. We only have to perform the evaluation of by GGA instead of LDA. where one of the approximate vectors, corresponding to an occupied state, is chosen as the initial vector . The iteration is repeated until a condition is satisfied. Only less than 10 iterations are enough to achieve the condition for each eigenstate. It is also noted that the shift-and-inverse Lanczos method can be skipped as the SCF iteration converges, since the eigenvectors found at the previous SCF step are good approximation for the shift-invert method at the next SCF step, which allows us to accelerate the calculation. and otherwise is zero. All the analytic formulas for , , , and and MATHEMATICA codes for generating them are provided in Sec. S-22 of the supplemental material. where one of the approximate vectors for an occupied state is chosen as the initial vector . As well as the shift-invert method by Eqs. (35)-(37), one can achieve sufficient convergence by only less than 10 iterations by Eqs. (73)-(77). The matrix multiplication with is performed by making use of the LU factorization in O( ) operations as in the LDA calculation. We employ the conventional scheme for the diagonalization in the initial stage of the SCF calculation, and switch it to the above shift-invert method after several SCF iterations, which accelerates the calculation, since a few eigenstates only have to be evaluated in the scheme. where is the correlation energy density, and . The expressions, Eqs. (78)-(80), for the virial theorem can be derived as shown in Ref. by using the generalized procedure by Slater. On the other hand, the virial theorem simply holds in the HF method without any correction. Table 1: The virial theorem and the total energy in hartree calculated by the LDA and HF methods for the ground state of a helium atom. of 10 bohr is used as the maximum range of -coordinate. The bold font means that the number is exact. In Table I we show the convergence of the virial theorem and the total energy for the LDA and HF calculations of a helium atom as a function of the number of meshes, where of 10 bohr is used as the maximum range of -coordinate for all the cases. The analytic functional form parametrized by Vosko, Wilk, and Nusair is used for the LDA calculations. All the calculations in the study are performed using long double of 80 bit which has 19 significant digits decimally. It is found that the errors in the virial theorem and the total energy for the both cases algebraically decay as the number of meshes increases. Also we see that the order of the errors in the virial theorem and the total energy are almost equivalent to each other, which supports that the evaluation of the virial theorem can be a measure of checking the accuracy of the total energy. Using 1280 mesh points, corresponding to bohr , the total energy is calculated with accuracy of 14 digits for the LDA and HF calculations. It is worth mentioning that the total energy converges from above as the number of meshes increases for both the LDA and HF calculations, which indicates that the method can be regarded as a variational method in practice. 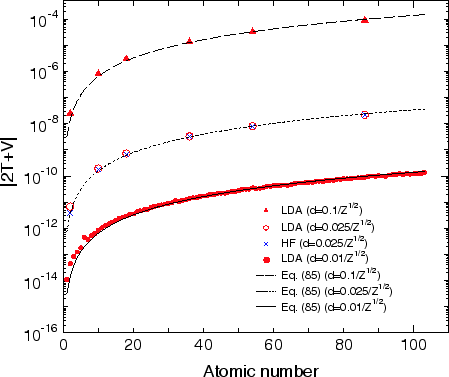 We further verify the accuracy of the method by applying the FE method to all the atoms (Z=1-103) in the periodic table within LDA and a series of rare gas atoms within the HF method, where the spherical charge density distribution is assumed for the non-spin polarized ground state electronic configuration in the LDA calculations. Figure 2 shows the absolute value of the virial theorem, , as a function of atomic numbers. By considering that the eigenenergies of hydrogen like atoms scales as , the mesh spacing are taken to be inversely proportional to so that the bare Coulomb potential at can be proportional to . The error in the virial theorem for the LDA calculations with the mesh spacing of is and hartree for hydrogen and lawrencium atoms, respectively, and the errors of the other cases are in between those of the two atoms, which suggests that using the mesh spacing the total energy for LDA can be computed within error of hartree for all the atoms in the periodic table. In addition to , we also check a variant of the virial theorem (not shown), and find that is about for all the atoms, indicating that the relative error is almost constant and the number of accurate digits of the total energy is almost equivalent to each other, which is 13-14 digits in the case of the mesh spacing of . It is also confirmed that all the calculated results by LDA are consistent with the results by Kotochigova et al. The error in the virial theorem in the HF calculations with the mesh spacing of varies in a similar way to that of the LDA calculations. The same analysis as the LDA case implies that the total energy of the HF calculations can be obtained within error of hartree and that the number of accurate digits of the total energy is 11-12 digits for all the rare gas atoms in the case of the mesh spacing of . The LDA calculations with the coarse mesh spacing are also presented for comparison, showing that the error in the HF calculation is comparable to the corresponding LDA calculation if the same grid spacing is used. The comparison leads to another conclusion that the numerical fitting of exchange-correlation and hartree potentials in the LDA calculations is not a source of numerical errors. In both the LDA and HF calculations the error in the total energy mainly comes from expansion of the wave functions by the finite basis functions. Figure: (Color online) The absolute value (hartree) of the virial theorem, , as a function of atomic numbers calculated by the LDA and HF methods, and corresponding curves of error estimated by Eq. (85). The non-spin polarized ground state electronic configuration is considered for all the cases, and the spherical charge density distribution is assumed in the LDA calculations. The mesh spacing is taken to be , , bohr . of 10 bohr is used as the maximum range of -coordinate for all the cases. where , , and are found to be -6, 2, and 0.3 by fitting Eq. (85) to the data shown in Fig. 2. As shown in Fig. 2 the estimated error by Eq. (85) fits well with that in the whole range we study. Strictly speaking, the expression of Eq. (85) estimates the error in the the virial theorem, since the fitting is done using the virial theorem . However, the expression can be used to estimate the error in the total energy due to the near equivalence of the error between the virial theorem and the total energy. The expression implies that the error in the total energy approximately scales as or when or are fixed. As well as the convergence property of the total energy, the eigenvalue of state and the charge density at the origin in the ground state of a helium atom are shown as a function of the number of meshes in Table II. Although these quantities slowly converge compared to the total energy shown in Table I, it can be seen that the systematic convergence produces highly accurate results for both the LDA and HF calculations. Table 2: The eigenvalue (hartree) of 1s state and charge density at the origin in the ground state of a helium atom. of 10 bohr is used as the maximum range of -coordinate. The bold font means that the number is exact. We have developed an accurate FE method for atomic calculations based on DFT within LDA and the Hartree-Fock method. 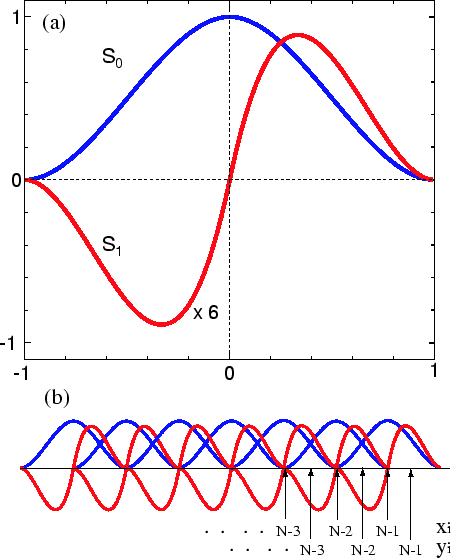 Cubic Hermite spline functions on a uniform mesh for are used as basis functions to expand the radial wave functions. The numerical integrations being a source of numerical error can be avoided due to the simplicity of the cubic Hermite spline functions, and all the associated integrals are analytically evaluated in conjunction with fitting of the hartree and exchange-correlation potentials to the same cubic Hermite spline functions. By taking account of the localized nature of the basis functions in real space, the generalized eigenvalue problem is efficiently solved using a generalized shift-invert iterative method for not only the LDA but also HF calculations. The numerical calculations show that the convergence is systematically controlled by the mesh spacing and in practice numerically exact solutions can be obtained within machine precision for all the elements (Z=1-103) in the periodic table. The convergence of the total energy from above implies that the FE method can be regarded as a variational scheme with respect to the Hermite spline functions for both the LDA and HF methods. Based on the virial theorem and an intuitive analysis the absolute error in the total energy is estimated to be proportional to . The absolute error is less than hartree for the LDA and HF calculations when the mesh spacing is taken to be bohr . Since the FE method can provide high quality numerical solutions with a similar degree of accuracy for both DFT and the HF method, this can be utilized as a platform, which is free from the non-intrinsic numerical error in the validation of newly developed methods, for development of new functionals in DFT such as hybrid functionals. Along this line, we have been trying to develop a hybrid exchange hole model based on the FE method, which will be discussed elsewhere. The authors were partly supported by the Fujitsu lab., the Nissan Motor Co., Ltd., Nippon Sheet Glass Co., Ltd., and the Next Generation Super Computing Project, Nanoscience Program, MEXT, Japan. J.C. Slater, Quantum Theory of Atomic Structure, Vol. 1, McGraw-Hill, New York, 1960. J.C. Slater, Quantum Theory of Atomic Structure, Vol. 2, McGraw-Hill, New York, 1960. D. Feller, K.A. Peterson, and T.D. Crawford, J. Chem. Phys. 124 (2006) 054107. R.M. Martin, Electronic Structure: Basic Theory and Practical Methods, Cambridge University Press, New York, 2008. T. Helgaker, P. Jorgensen, and J. Olsen, Molecular Electronic-Structure Theory, Wiley, 2000. C.E. Dykstra, G. Frenking, K.S. Kim, and G.E. Scuseria, Theory and Applications of Computational Chemistry: The First 40 Years (A Volume of Technical and Historical Perspectives), Elsevier, Amsterdam (2005). B.W. Shore, J. Chem. Phys. 58 (1973) 3855. J.L. Gázquez and H.J. Silverstone, J. Chem. Phys. 67 (1977) 1887. C.F. Fischer and W. Guo, J. Comp. Phys. 90 (1990) 486. H.T. Jeng and C.S. Hsue, Chin. J. Phys. 35 (1997) 215. Z. Romanowski, Modelling Simul. Mater. Sci. Eng. 16, 015003 (2008); ibid. 17 (2009) 045001. D. Engel, M. Klews, and G. Wunner, Comp. Phys. Comm. 180 (2009) 302. S.R. White, J.W. Wilkins, and M.P. Teter, Phys. Rev. B 39 (1989) 5819. E. Tsuchida and M. Tsukada, Phys. Rev. B 54 (1996) 7602. J.E. Pask and P. Sterne, Modelling Simul. Mater. Sci. Eng. 13 (2005) R71. E.J. Bylaska, M. Holst, and J.H. Weare, J. Chem. Theory Comput. 5 (2009) 937. P. Hohenberg and W. Kohn, Phys. Rev. 136 (1964) B864. W. Kohn and L. J. Sham, Phys. Rev. 140 (1965) A1133. A.D. Becke, J. Chem. Phys. 98 (1993) 1372. T. Leininger, H. Stoll, H.-J. Werner, and A. Savin, Chem. Phys. Lett. 275 (1997) 151. H. Iikura, T. Tsuneda, T. Yanai, and K. Hirao, J. Chem. Phys. 115 (2001) 3540. J. Heyd, G.E. Scuseria, and M. Ernzerhof, J. Chem. Phys. 118 (2003) 8207. T.M. Henderson, A.F. Izmaylov, G. Scalmani, and G.E. Scuseria, J. Chem. Phys. 131 (2009) 044108. In addition to the change of variables, , we tried two other cases, and , and found that the latter two cases lead to complication in the formalism. D.M. Ceperley and B.J. Alder, Phys. Rev. Lett. 45 (1980) 566. S.H. Vosko, L. Wilk, and M. Nusair, Can. J. Phys. 58, (1980) 1200; S.H. Vosko and L. Wilk, Phys. Rev. B 22, (1980) 3812. J.P. Perdew, K. Burke, and M. Ernzerhof, Phys. Rev. Lett. 77 (1996) 3865. In addition to the cubic Hermite spline functions, we investigated the convergence of the quintic Hermite spline functions, and found that the convergence ratio with respect to the total number of basis functions is comparable to the cubic case. Thus, it is concluded that the cubic Hermite spline functions is an optimum choice with respect to the convergence ratio and the simplicity of analytic expressions derived for matrix elements. Z. Bai, J. Demmel, J. Dongarra, A. Ruhe, and H. van der Vorst, Templates for the Solution of Algebraic Eigenvalue Problems: A Practical Guide, Society for Industrial Mathematics (1987). F.W. Averill and G.S. Painter, Phys. Rev. B 24 (1981) 6795. J.C. Slater, J. Chem. Phys. 57 (1972) 2389. The total energy we obtain corresponds to that in the nonrelativistic HF limit, which lacks the correlation energy of -0.042044 hartree compared to the exact energy of -2.903724 hartree. The program code, ADPACK, and the calculated results are available on a web site (http://www.openmx-square.org/).